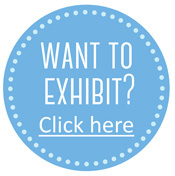 See creative flowers and blooms – all in paper, at the Paperazzi display by Michelle Lackenby. Michelle Lackenby is a qualified lecturer in the areas of visual communication, graphic design and photography and has always been obsessed with pushing the boundaries of art and design within the realm of paper and bookbinding. She has over 20 years industry experience in creative fields which led to the opening of her own business specialising in artist services, design and workshops. 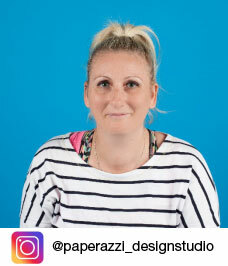 Michelle is the resident paper artist for Paperazzi Design Studio where she collaborates with other artists on installations and bringing paper visions to life. Join Michelle each day on stand for an intimate class learning how to create perfect paper pieces. There’s a different class at 1pm each day. 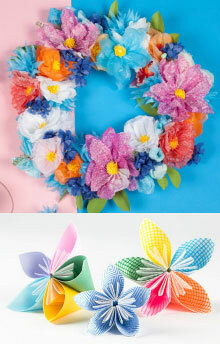 1pm Create detailed paper flowers that will outlast any florist’s work. 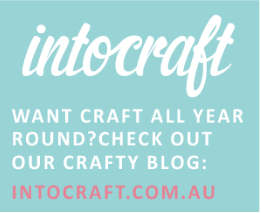 Michelle will guide you through the art of paper flower making, using simple tools and techniques. You will design and create your very own paper flower bouquet with a variety of flower types to take home with you and wow your friends and family! Learn where to find all the supplies you need to continue creating beautiful flowers at home, including paper choice, tips and inspiration for ongoing projects. 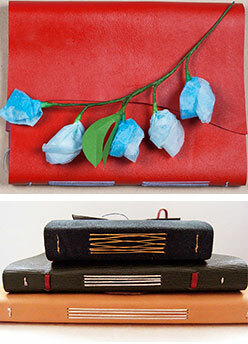 1pm Learn the art of Japanese bookbinding using beautiful handmade papers to decorate covers of books. You will learn various Japanese binding stitch techniques and patterns and how to create your very own books to take home. The techniques covered include simple Japanese stitch, Japanese stab binding, hemp stitch and tortoise shell binding. Each technique builds on the last and you will create your own set of soft cover books to take home. These Japanese journals make excellent gifts and can be used for any purpose. Think photo books, writing journals, travel diaries – the possibilities are endless! 1pm Learn to make your own leather bound journal with Michelle, who will share tips and tricks to create a beautiful handmade leather journal with a long stitch spine. 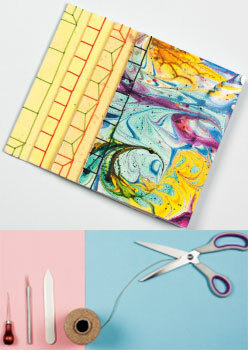 This bookbinding technique creates visual diaries, portfolios, photo albums – the list is endless!